I won't even pretend I have anything to write about. It's cold here. It's been snowy - not heavy snow, but still enough daily to keep things whiter than David Dukes' picnics......or John Kasich's administration. Sounds like we're in for a potential 'wintry-mix' on Monday, you know, the day before I leave for a work trip. I love fighting for my own seat on the plane because four other flights have been canceled. Then I get to fly there and drive - and since I'm heading east, I'll most likely hit the storm a second time. Joy of joys. The good news is - weathermen are wrong about 40% of the time, so who the hell knows what is what. Let's see, what else? I ordered a new pair of eyeglasses yesterday. I'd show you a picture of them (I didn't go with the ones from my year-end photo entry.....at least not yet), but that can be an entire other blog entry when they come in next week. I did take pics of me in them, but here's the deal: I look good in them (I think), but they (and me) photograph horribly. I tried like six times and each was worse than the last. No worries, when I get them, good or bad, I'll let you see them. So, what do I have for you today? Well, I've been sitting on this image I snapped about a month ago. I was actually praying (ok, maybe wishing) for a red light - and I got one. Thanks Jambi. Spiritfinders is 'real'. Or just a sham for the merch. That's my guess. They're GMC white van isn't nearly as cool as the ambulance in the movie. 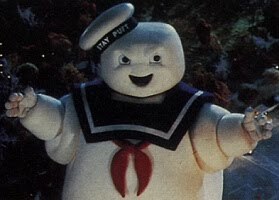 Where do they even store their charged particle beam proton packs? I do like the decal of Casper though. Or as Bart Simpson said, he bore an uncanny resemblance to Richie Rich. But really - who the frick makes decals of Casper the Friendly Ghost? Can even creating the design, let alone producing and distributing it ever bring a return on investment? For someone who had nothing to write about, I sure ended up writing a hell of a long post - and I'm not even drunk. LOL! 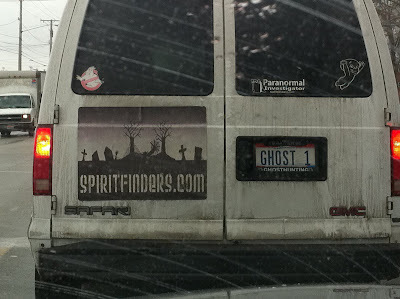 I first read that bumper sticker as "spirit fingers"-- and couldn't understand the graveyard connection to Bring It On. I'm sure the pics of you wearing your new eyeglasses look just fine! I don't think any one really likes pictures of themselves. I have just one question, can Spiritfinders locate the whereabouts of your former neighbor Dorothy Fuldheim? what a job; I hope it isn't too dull.